September 11, 2001 was a day when America faced the most horrific attack on American soil that the world has ever seen. It was a day that most Americans who were alive and old enough to know what happening, remember exactly where they were when they first heard the awful and shattering news that the first of the Twin Towers had been hit by an airplane. Apparently, Rep. Ilhan Omar D-Minn., who became the first Somali-American elected to Congress in November, did not feel the horror that Americans felt on that day. 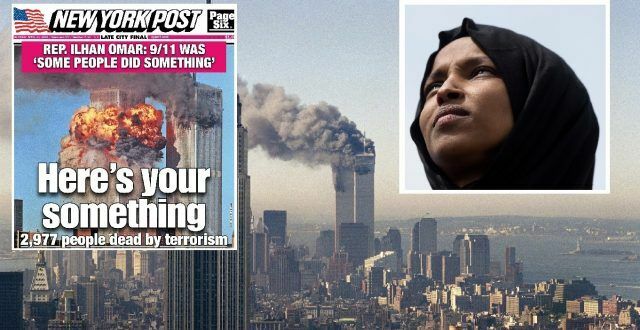 On Thursday the New York Post hit Omar back on comments she had previously made about the fatal day. Most Americans have the image that appeared on the cover of the New York Post imbedded in their minds. The dramatic front page had an infamous photo of New York City’s Twin Towers on fire on the day of the attacks. After two planes that were hijacked hit the towers, they collapsed leaving nearly 3,000 people dead and numerous others injured. Omar called upon other Muslim-Americans to “make people uncomfortable” with their activism. As if this wasn’t bad enough, another part of the speech surfaced on social media this week in which Omar went on to describe the terror attacks that Al Qaeda was responsible for. Omar made an appearance on the “The Late Show with Stephen Colbert” on Wednesday night. She wasn’t asked about her latest comments. She did, however, say that she was still “learning” after she was accused of making an anti-Semitic remark in February. As much as Omar will acknowledge the “pain” of her constituents, Omar did not seem to concede the “pain” of the American people who suffered and will remember all the details of the day in American history that we cannot forget.